Patna is one of the most densely populated cities in Eastern India. Though the city has got many good hospitals and health care centers it still lacks proper treatments for the critical diseases and other medical conditions. If patients are being diagnosed with Cancer, Coronary Diseases and Brain Stroke and other ailments then they have to move to major cities like Delhi, Mumbai, and Vellore etc. 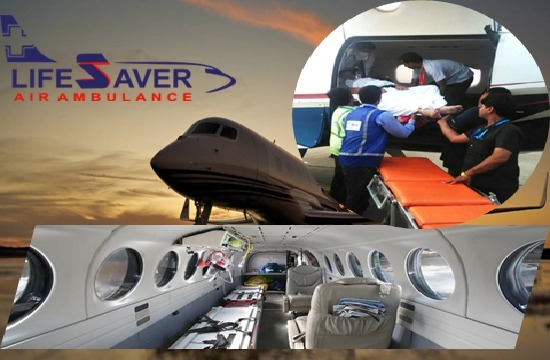 We provide the graceful Air Ambulance in Patna which is inexpensive to cut the spiraling cost. Bed to Bed patient transfer with 24/7 on-call assistance is provided in order to ensure the utmost safety of the patient. We have excellent patient management to take very good care of the people suffering from distinguished diseases. Call our customer support to book an Air Ambulance in Patna with world class and benchmark facilities now. Address - Lifesaver Air Ambulance Services, Flat No. 302, 3rd Floor, L.N. Tower, Opp. Chunnilal Mega Mart, Kankarbagh Main Road, Patna-20.